Date:	2014-07-30 / 23h 00m U.T. Assessments:	The cumulus appears as a fuzzy patch of gray, more or less circular, more blurred around the edges and more defined (bright) to the center, can not resolve stars. 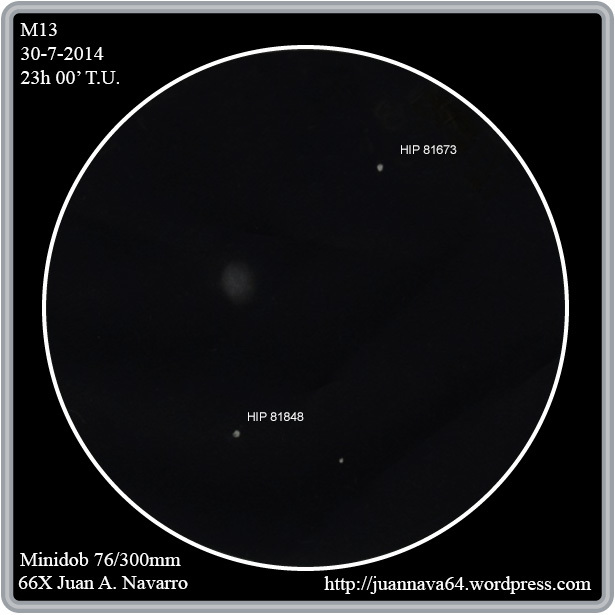 Hi Juan, it’s a good idea to represent what is seen with small instruments or not perfect skies (from center of cities, with moon,…) to show what is real stargazing. It’s so easy to watch the sky with a 300 to 450mm telescope ! I just took back my first 114mm Newtonian tube and I’ll use it. Good skies to you !